Flash Fiction: The Birds Tick Time, by K. S. Moore. The birds tick time outside my door. I count the seconds, the colours. Such small lives. The bluetits and coaltits are the everyday ordinaries. If they were human they would wear a suit and tie, hold on to their jobs for dear life. The greenfinch are more brash, quick to flare and physically squabble. 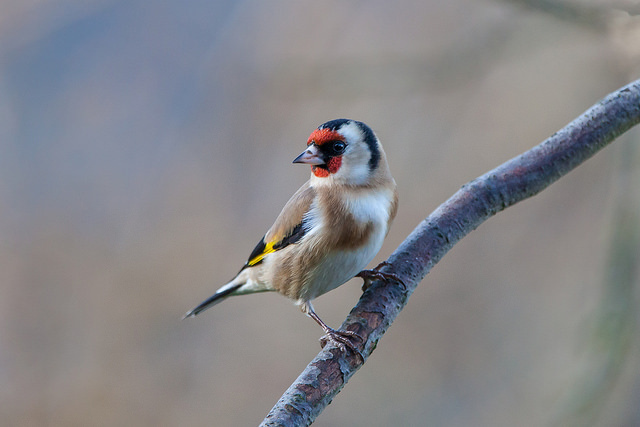 Their goldfinch cousins pick meticulously at daisy heads, gauging love and love-nots as they go. Some flirt with dandelion clocks, are greedy for the white floss. Their only wish is that their nests be comfortable. The grey crow brings a shadow to the scene. His silver dot of an eye rolls with him as he moves forward. The little birds take trembling flight, leave him to peck at the spilled grain. Ben usually opens the window or claps his hands to scare the crow away. But he is sitting down, immobilised by the row. I’m ready to face him, tell him the truth. He nods and his face is like paper against the shocking red of his favourite chair. Note: I often talk about birds on this blog and remembered this piece of flash fiction, written some time ago. I think it illustrates the strong characteristics displayed by birds. Their behaviour provides the perfect background to a piece of tense fiction!